- Publisher In this provocative book, pastor John avant encourages readers to uphold a consistent practice of what they believe, not just a verbalization of what they believe. If Christians truly believe in God, they should live genuinely changed lives as the ultimate proof that He is real. Many Christians live their lives as if they do not believe in God. They go to church and praise His name on Sundays, but in their daily lives they don't think about the Lord that often. They don't show much concern or charity for others. They don't feel gratitude to the Lord for His blessings. They don't allow God's love to be reflected in their actions-giving Christianity a bad name in the process. In their practical, day-to-day lives, many Christians are almost living as though they are atheists. Pastor Avant witnesses many Christians not living up to their claims, and he asserts that there is not much Christ left in that form of Christianity. In If God Were Real, he challenges Christians to consider whether or not they believe in God. If they do, Pastor Avant wants readers to consider what life would be like if they lived as if they believed in God. He advocates for the pursuit of a new Jesus movement that resembles Christ's original followers-followers who were so steadfastly devoted to Him that their every action reflected His glory. With If God Were Real, readers will embark on an adventure of discovery of the real God and a life lived in praise of Him. 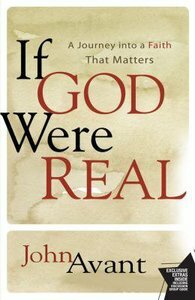 About "If God Were Real"
In this provocative book, pastor John avant encourages readers to uphold a consistent practice of what they believe, not just a verbalization of what they believe. If Christians truly believe in God, they should live genuinely changed lives as the ultimate proof that He is real.